Nana Bugge Rasmussen is a Danish Opera Singer, who works with Lied as well as opera and church music. Already parallel to her studies she appeared as a soloist in both operas and operetta in Denmark and Germany. Already as a child, Nana Bugge Rasmussen was greatly interested in singing and so she got her first vocal training in the Childrens Choir of the Royal Danish Academy of Music, where she started at eight years old. Parallel to private vocal studies with opera singer Anne Margrethe Dahl, she studied philosophy at the University of Copenhagen from 2005 to 2007, where she got accepted both at the Royal Danish Academy of Music (RDAM), Copenhagen, as well as at Universität der Künste, Berlin. She ultimately began her studies in Berlin and continued in Copenhagen and, in 2010, she gained her BA-degree from RDAM, and in 2013 her MA-degree. Already parallel to her studies, she had appeared as a soloist in both operas and operetta in Denmark and Germany. Also a keen lieder-singer, she has given numerous recitals and has a vast repertoire within the field of church music. Since July 2015 she is part of the programme 'Den Unge Elite', sponsored by the Danish Arts Foundation: a grant given to highly talented musicians with focus on building an international career. 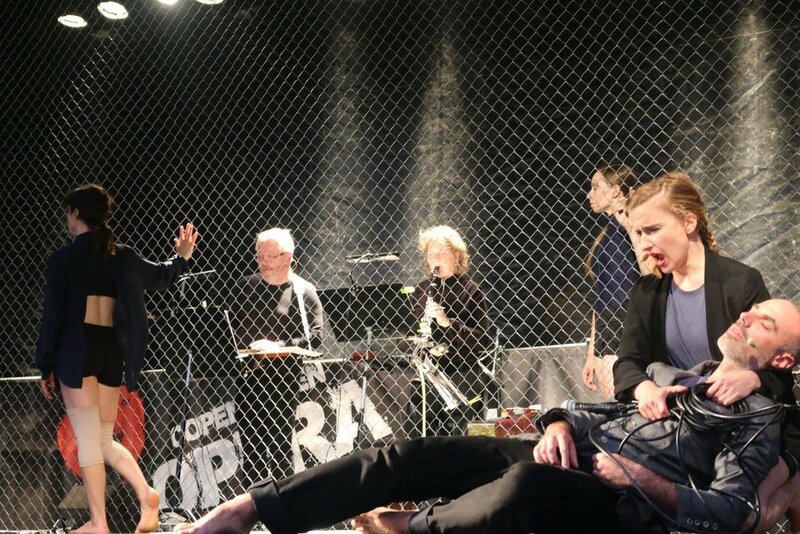 I worked with Nana in 2014 on the Copenhagen based "Figura Ensemble's" production "Et Glimt Saa Er Jeg Vaek" at the Marienlyst Castle in Denmark and then later in EXODUS in 2016. She is an extraordinary artist and a lovely human being and it felt natural to include her in our NE PLUS ULTRA interview series. Tell us a little bit about your background - when did you know that you wanted to become an opera singer and where did you receive your training? I knew from from a young age that I wanted to become a singer; My father is an opera singer so I was influenced by him. I got my first training in the Childrens Choir of the Academy of Music in Copenhagen and I was sure I would become a soprano or, well, I was a soprano as a child, most children are, so I was greatly disappointed the first time I was told to sing the alto voice. The Queen of the Night, Violetta, Mimi and all the others left me that day and never came back but with time I learned to love the possibilities in the mezzo/alto-field. Later I got my training at the Universitet der Kunste in Berlin and at the Academy in Copenhagen. I have now worked with you twice and you strike me as such a physical and dynamic yet precise performer. Was that part of your training and do you like to receive very specific blocking notes in the creation or staging of a piece or do you prefer to be able to be more flexible in your choices on stage? Well, to me the creation of a figure on stage should always contain more than the singing. Opera is by nature not as naturalistic as acting on it's own, but this should not be an excuse to forget about the physicality of the figure and actually I think there are hardly any limits to what you can do. It just sometimes has consequences for the singing - you have to consider your priorities in a given situation. I danced classical ballet as a child and since then the physical elements of my education have mainly been added by myself, varying according to what was needed. I like blocking notes if I can manage to make them my own. If not, I like to discuss them. It might very well be my problem, and not a problem of the note in itself; however, my problem will eventually be a problem of the production, so discussion might be useful... at the right time, of course. You never seem to pretend on stage, you really inhabit the roles that you do - what is your creative process in getting to that place and is collaboration important to you? Collaboration is crucial and I am very sensitive to what I call energies on stage, perhaps too sensitive, but I am working on that. I think the creative process consists of several layers processing at the same time: There ís language - the language of the sung text and the pictures, feelings and mood it creates in you. It ís connotations and context. Also, on an auditive level: Sometimes I like to just repeat text many times in many different ways and just see what it does. Sometimes it goes somewhere absurd. Then there ís more classical research about a period, a person, some incident, inventing relations on stage. And then last but not least the music, everything you know about it together with the intuitions of harmonies, phrasing, where it wants to go. And, with all of the above, what is the extract, the core of it all when carefully mixed - that core is the drive in the end and it should be. What have been some of the highlights so far in your career? I have had the great joy to collaborate twice with the amazing counter-tenor Andreas Scholl, who nowadays also conducts. He ís incredibly sharing and generous with his talent. Both times I sang Bach, a composer who ís for me out of this world, and with two fabulous orchestras, Accademia Bizantina and Kammerorchester Basel. In 2014 I sung Dido in Purcellís Dido and Aeneas - that ís a monumental role and it was wonderful to sing. Without naming any names can you describe an experience in your professional life with a director or a cast that was less successful and why that was? With this question I get back to the theme of energies - I have had a few times where the energies go in too many directions, that a cast simply doesn't aim at a common goal - or that the conflicts that might exist off-stage between set-designer and director go on-stage as a bad energy - and that ís really counterproductive for everyone. On the other hand I think it ís really rare that all of this works perfectly all the way through - and it might not be a big problem for the final result. What city in your opinion has the most exciting opera scene? It ís a hard choice but I think Berlin is amazing because there is such a vast amount of Opera houses with their various profiles. But perhaps I am also mentioning that city because I know it better than other cities. Theater an der Wien has a great profile when it comes to early music and they have made some beautiful productions in Oslo in their wonderful new Opera house there as well. What do you think are the most important psychological features that a successful opera singer has? Mental and physical stamina, a good balance between creativity and discipline. Where do you find inspiration for your work? I listen to other singers from many different periods. From great acting as well, and film, but mainly theater. And from art. Hieronymus Bosch has been a great inspiration in a lot of work, specifically with certain parts of Bach's music and generally with the church-music. Who are some of the people who have inspired you the most in your work and why? Andreas Scholl with his musicality, my dad, always insisting that singing is not an excuse for bad acting and unnatural moves on stage, Sarah Connolly for singing exquisitely, my singing teacher Susanna Eken for being so consequential and honest. Well. There are many. But these are a few. What is your favorite quote? I don't have one. But a good one is this, about what you do as a performer - Paraphrasing: A glass is not a mirror. You don't see yourself in it, you have to be able to look through and see the purpose of what you are doing, the audience, the responsibility towards the composer, the librettist. And the audience should be able to look through to you. You have to keep your glass clean to always stay focused on the purpose of performing, which is bigger than you - Janet Baker in conversation with Joyce DiDonato. Tell us about any projects that you have coming up and that you are excited about? Just now I am preparing a line-up of lied-recitals in November and May with a premiere of 4 songs written to Goethe's Mignon-texts from Wilhelm Meister by Swedish composer Filip Melo. It ís such a great program, apart from the premiere it consists of Schumanns Mignon-lieder, yes, to the same Goethe-texts, and of songs by Berg and Webern. It ís such a privilege to work on this gorgeously loaded music. Looking towards the future - where do you want to be and what do you want to be doing in 25 years? I would like to have a healthy voice which can still sing, and I would like to be able to have a bit more influence on the projects that I do. I have so many ideas floating around in my head and I think it will take at least 25 years before I will be able to make them all come true.